Centro Hípico Fin Del Mundo gladly invites you for an expedition where you will spend 10 days riding through the most magical and wild place of Tierra del Fuego, Peninsula Mitre. During these days, you will see mythical places, astonishing shipwrecks, traditional gauchos shelters and estancias, stunning landscapes and most amazing wildlife of Patagonia. During your expedition, you will sleep in the tents (double or triple occupancy), nearby the shelters you pass. Tents will be provided by Centro Hípico Fin Del Mundo. You only need to take your own sleeping bag. If necessary, there is always a possibility to warm up or dry your clothes inside the shelters. Depending on the weather each day, you may set up a fire outside or enjoy the evening in the shelter. Note: This tour also includes two nights' accommodation in Ushuaia (before and after the tour). The guests should arrive at Ushuaia the day before the start of the ride. They are picked up at Ushuaia-Malvinas Argentinas International Airport (USH) and transferred to their accommodation. In the afternoon / evening, a briefing with the group and coordinators is held to explain details of the expedition and answer all questions, check the equipment and provide saddlebags to be used during the ride. The program begins with a car transfer (230 kilometers) from Ushuaia to the ride starting point: Estancia Maria Luisa, a typical Patagonian establishment intended to cattle breeding. The road leads through some of the most iconic landscapes of Tierra del Fuego (Garibaldi Pass through the Andes and the Lake Fagnano panorama). At the interchange point, the horses are assigned, you will load your luggage and the real adventure starts. The first day is for acclimatization, without major difficulties. You will ride through some grassy hills up to the first river, which you can cross taking advantage of a low tide. This is the Irigoyen River, world famous for huge trouts. After a long beach ride, you will reach your first overnight place, Puesta La Chaira - first shelter of old Estancia Policarpo. You will sleep in the tents nearby. This is the last shelter inhabited by the gauchos on the route, later on, you can meet only wild animals. After breakfast, you will start the long day of riding with a final destination at Puesto Rio Bueno (the shelter). All traces of civilization slowly disappear and you can finally see the wilder side of Tierra del Fuego. On the road, there are several shipwrecks, like the "Barca" - an old wooden boat, buried by sand for centuries. There are also abandoned shelters on the way. Many of them are built with remains of some other ships. One can see the fauna of "Land of Fire" in all its glory here: curious foxes, herds of guanacos, majestic condors, beavers and birds of all kinds, and with little luck: marine mammals or penguins. The list is long. Here the traces of native Haush Indians can be found as well. After passing the river Leticia, you will reach the shelter. The trail generally follows the beaches, which you can traverse during the low tides. At the destination, you can enjoy the evening by the fire, get warm or dry your clothes if necessary and then split up to sleep in tents near the shelter while listening to the sound of the ocean. During this day, you will cross two rivers: Rio Bueno and Rio Policarpo, and finish your ride at the remains of Estancia Policarpo which was declared a National Historical Monument. Conditions of traveling are similar to the previous day with the addition of several peatlands where your horses can show their amazing skills in finding the safest way through. You will have a chance to meet plenty of wild animals, including herds of wild horses, colonies of sea lions and possibly even some solitary king penguins. On this day, you will also visit the most famous of all the shipwrecks in the Mitre Peninsula - the British clipper Duchess of Albany. Then, you reach a wide hill from where you can see Caleta Falsa bay – your destination. The center of the bay used to be the heart of Estancia Policarpo which was founded in the beginning of the 20th century. This establishment was abandoned since the 60s. If you look around, traces of history could be discovered at every corner: sprockets, saws, various tools. Nature is slowly taking back those terrains, creating the most nostalgic views. You may be lucky to enjoy them in a beautiful scenery of the sunset. After leaving Caleta Falsa bay, you will pass several beaches. At Laguna Centenario, you can enjoy a unique spectacle: the varied species of birds of Tierra del Fuego, in all their glory. You may see, among many others: cormorants, southern crested caracaras, as well as the two emperors of the sky: black-browed albatrosses and Andean condors. You may also pass a colony of sea lions (depending on the season, they may be even accompanied by their lovely puppies). Afterward, you will leave the beaches for the moment to ride further into the land through the Fueguino peatland. If the weather is good, you may see the mythical and inaccessible State Island with its San Juan de Salvamento lighthouse which became famous after publishing Jules Verne’s book “The Lighthouse at the End of the World”. The peatland (turba) becomes more boggy here, which force us to dismount the horses on several occasions and cross some sections on foot. Finally you arrive at Bahia Thetis, there used to be a factory (loberia), now abandoned, where the sea lions were caught to get the skins and fat. There is also another interesting historic point here - former Argentina Subprefecture (1889 - 1896), military detachment and rescue shelter for survivors of the shipwrecks. Due to the impressive landscape and historical significance of the place, it is planned that you will stay an extra day at this point of your journey. Optionally, Centro Hípico Fin Del Mundo offers a hike to the Cape San Diego Lighthouse, on the farthest east end of Tierra del Fuego. The walk is approximately seven hours (round trip) on the mostly flat path. You will follow the coast and then cross the channel leading to the inner bay. The land where you walk is mostly covered by peatland. You may have an opportunity to see guanacos (mini-lamas) within a stone’s throw. Slowly, you approach the farthest east end of Tierra del Fuego - Cape San Diego. There, you can enjoy an exceptional, 360-degree view of South Atlantic Ocean, Strait of Le Maire, Staten Island and the entrance of the Beagle Channel. Of course, you can also explore the old lighthouse and then have lunch with the most heartbreaking panorama of the surroundings. Nearby, you may even see a small colony of seals. In the afternoon, you will walk back enjoying again the iconic Patagonian landscape with the typical trees shaped by the wind. Please note that this hike is quite long and can be tiring. Good trekking shoes would be required. On this day, you can enjoy short walks around the area and explore this beautiful land, observe the wildlife or look for the traces of Indians who used to live here in the past. This can let you fully experience the magic of this ultimate "End of the World". Or, if you prefer, you may as well stay at your camping site and contemplate the landscape with a glass of delicious wine. During this calm day, you would rest and regenerate before your way back. You will follow back your traces returning from Bahía Thetis to Estancia Policarpo. Once again, Centro Hípico Fin Del Mundo's incredible Criollo horses will prove their strength and skills when passing the turbas (peatlands). The views from the cliffs give you an extraordinary spectacle of light and colors, a beautiful landscape of sub-Antarctic forest, Andes and South Atlantic. Halfway there, you have a lunch break and afterwards, you will continue towards Policarpo shelter. After preparing the horses, you will slowly leave Caleta Falsa bay, cross the peatland again to arrive at the coast next to Rio Policarpo (the widest and most challenging river during our expedition). On the second bank lay the longest beaches of your journey (Donata and Policarpo Bay). Here, you may enjoy long canters with the incredible feeling of freedom and being part of the nature. With little luck, you can also meet there large groups of wild horses in their natural habitat. This is an unforgettable experience. You will have a break near the old “Duchess of Albany” wreck to rest, eat and make some more photos. Passing grassy cliffs, you can see herds of wild cows and then again we step on the beaches. As your luggage becomes smaller and lighter, you may enjoy faster pace (more trots and canters) on the way back. Eventually, you can have a dinner and generally relax, possibly by the fire next to Rio Bueno shelter. In the morning, there is some time to walk around Rio Bueno shelter and listen to stories about legendary "puesteros" of Peninsula Mitre, who used to live here in the past and work with cattle. Then, you will mount your brave horses again and after crossing Leticia River, you will climb at the top of the grassy cliff on the other side. From this point, you can appreciate panoramic views of the entire region and look back on the long route you traveled so far. In this section, there is also enough time for relaxing breaks. Before arrival at La Chaira, one more time, you can enjoy long gallops on the magnificent beaches. In the evening, with the gleefully shimmering bonfire by the side, you have a farewell dinner and time for sharing the stories of our expedition. You will leave La Chaira saying goodbye to the gauchos of the Peninsula Mitre. You will also leave behind the most remote and wild region of Tierra del Fuego, and this is the last part of your unique and unforgettable experience there. Slowly, after crossing Río Irigoyen, you will return to civilization. At Estancia Maria Luisa, where you finish the horseback riding, you will take off saddles and your luggage from the brave horses that can also rest now after the whole expedition. The last leg, back again to the place of your accommodation in Ushuaia, you will travel by car. The program can be modified by the guide, due to force majeure, weather or logistics, to ensure maximum safety and comfort for guests, taking into account the best interest of the whole group. The guides will do everything in their power so that you can enjoy the unforgettable and unique expedition, basing on their experience in the area. The guides’ decisions are final. Especially in such isolated places the success of the tour depends on the collaboration of all the riders. The guests should understand that they are all part of the same group, and they need to help each other. Although Centro Hípico Fin Del Mundo hopes you will see all kind of animals and experience many unique moments during the trip, they cannot guarantee encounters with everything that is shown on the photos. There is a reason why it is called wildlife! The horses you use are Argentinean Criollos that are world renowned for their calmness, bravery and hardiness. 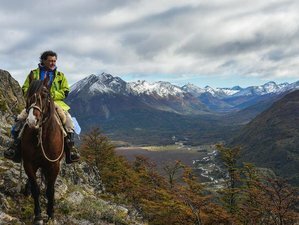 Centro Hípico Fin Del Mundo's horses are bred in Tierra del Fuego and are used to every type of terrain. Their average height is 1.55 meters. Centro Hípico Fin Del Mundo uses "Cangalla" saddles which is typical Argentinian gaucho’s equipment, covered with sheeps skins, designed specially for comfortable long distance riding. Centro Hípico Fin Del Mundo does not use spurs. There is about six to seven hours of horse riding a day, including lunch breaks. The average distance per day is 30 kilometers (with exception of the first and the last day). This tour presents a medium level of difficulty. A basic knowledge of horse riding and good general health condition is necessary. The terrain of the route is varied, but dominated by long, flat beaches. There are sections of turba - peatland (where sometimes is necessary to dismount and walk on foot) and grassy meadows. Additionally, there are areas of dense forest and you will often go up and down the steep cliffs. There are four main rivers which you pass at a low tide. The Atlantic tides schedule regulates the daily rhythm. The site is completely isolated and out of reach by the conventional emergency services. In case of emergency, Centro Hípico Fin Del Mundo provides any necessary contact via satellite phone. The guides accompanying the group are certified as SAN-WFR (Socorrismo para Ambientes Naturales / Wilderness First Responder) and have completed first aid training. The Mitre Peninsula is the southeastern part of Tierra del Fuego (Land of Fire), the true "End of the World". You will explore one of the most virgin places that people with adventurous hearts, who desire to discover the magic and myths of this part of America, can appreciate the most. The tour will be a real expedition out of civilization. Day by day overcoming immeasurable distances, you will go deep into the most authentic nature of Tierra del Fuego. Travelling by horses, as the most traditional way of transportation, allows to share the same experiences as the first heroic explorers of Patagonia. You will follow their footsteps and enjoy the same landscapes, but above all, you would be close to nature on the journey. The travel will be dictated by the eternal rhythm of the tides of the Atlantic Ocean, which will let you traverse the endless beaches. That gives you a perfect opportunity for long gallops. You will have a chance to see the most diverse wildlife of Tierra del Fuego, including condors, seals, herds of guanacos and majestic wild horses; most probably lovely penguins also will cross your paths. You will discover skeletons of whales and sea lions that come to die at secluded beaches, shipwrecks of all ages that dared to challenge one of the most dangerous waters of the world, remains of shelters abandoned after its golden age and traces of native Indians living there in the past. This fascinating land is still studied by scientists from all over the world (biologists, archaeologists, anthropologists, geologists and historians). There will be countless stories to listen to by the fire at nights with waves of the South Atlantic Ocean playing lullabies for you. Sleeping in your tents under the stars with the bright Southern Cross above you will let you fully appreciate the harsh beauty of the tough life here, so different from the usual, civilised world. In short words, this will truly be a unique experience, and Centro Hípico Fin Del Mundo can promise you that nothing will ever be the same after your return. General kitchen equipment like: cutlery, cups, pots, etc. The goal of Centro Hípico Fin Del is to provide all visitors with an unforgettable experience presenting wildlife, history and culture of Tierra Del Fuego.